Elden DeWitt’s story is told in a newspaper article found in the June 14, 1927 issue of the “Geraldton Guardian,” a Washington State newspaper. Written sometime after his death it provides some interesting insight into the man and his business. That in the United States, where the newspapers chronicle every action of persons of wealth, a man could acquire a fortune of $17,000,000 without the public being aware of the extent of his riches is disclosed by the death of Mr. Elden C. Dewitt. It has been discovered with nothing short of amazement by the newspapers that Mr. Dewitt lived in New York for 20 years as the head of a drug and medicine firm which bears his name without being once mentioned in print. During that time he built up his large fortune, which he left to his wife and upon her death to fourteen relatives. Only when the filing of the will disclosed that he was unusually rich did the newspapers print his name. Then they had great difficulty in learning how he amassed his millions. Born 72 years ago in Iowa, he began as a clerk in a chemist’s shop and ultimately became its proprietor. He started to manufacture his own remedies for common ills and the business gradually grew until the firm had branches in Europe. A close search revealed that he once received newspaper attention when in 1895 he participated in an election campaign to reform Chicago, but beyond that he had succeeded in avoiding publicity. E. C. DeWitt & Co. is first listed in the 1890 Chicago directory, classified as a patent medicine business and located at 253 Kinzie. Prior to that DeWitt was partnered with Charles W Beggs in the business of Beggs and DeWitt. They were classified as either medicines or pharmacists, and listed in the Chicago directories between 1887 and 1889 at 197 Michigan. In 1890, Beggs remained at the Michigan Avenue location, starting the Beggs Manufacturing Co., also a patent medicine business. E. C. DeWitt & Co. maintained the Chicago location at least into the 1960’s. During this time frame, I’ve tied them to several different addresses based on limited directory information: 253 Kinzie (1890), 160 Superior (1897), 205 Lasalle (1898 – 1907), 1127 – 1131 N Lasalle (1911 – 1920’s) and finally 2830 Sheffield Avenue (1940 – 1960’s). The E.C. DeWitt & Co., Inc., of New York was recently incorporated with a capital of $2,000,000. to deal in drugs and pharmaceutical supplies. The directors are Elden C. DeWitt, Cora E. DeWitt and Christopher E. Millar of New York. Similar to Chicago, the New York offices moved around quite a bit. Their New York addresses included: 1133 Broadway (1904 – 1905), the Times Building (1906 – 1909), 244 W 49th Street (1910), 146 West 52nd Street (1912 – 1915), 30 E 42nd Street (1916 -1919) and 512 Fifth Avenue (1922 -1925). During this period, Elden DeWitt also listed several residential addresses in New York, including the Plaza Hotel for a few years, confirming the above story that he lived the last 20 years of his life in New York. The company maintained a New York location at 750 Fifth Avenue well into the 1960’s. One indication of the early success of the company can be inferred from an item published in the January 1906 issue of N.A.R.D. Notes (National Association of Retail Druggists). In it they stated that E. C. DeWitt & Co. had sent contracts to serve as one of their distributing agents to 40,000 retail druggists . Within 18 days, 20,000 had already been signed and returned. One Minute Cough Cure was one of many patent medicines manufactured and distributed by the company. An advertisement from the early 1900’s stated that it does not pass immediately into the stomach, but lingers in the throat, chest and lungs producing a list of ten desired results. The products of the above firm (E. C. Dewitt & Co.) are exceedingly variable in composition. The literature put out by the firm is often false and misleading. Even it’s affidavits are deceptive and give the reader a false notion. Such methods and preparations cannot be too strongly condemned. cease falsely representing it in its advertising that its product will shrink, avoid need for surgical treatment on, heal, cure, or remove hemorrhoids or effect any other cure beyond temporary relief. Church & Dwight Co. Inc., a $3.4 billion consumer packaged goods company, acquired DeWitt International Corp. in 1986. Church & Dwight’s web site states that they were able to diversify into over-the-counter pharmaceuticals through that acquisition. 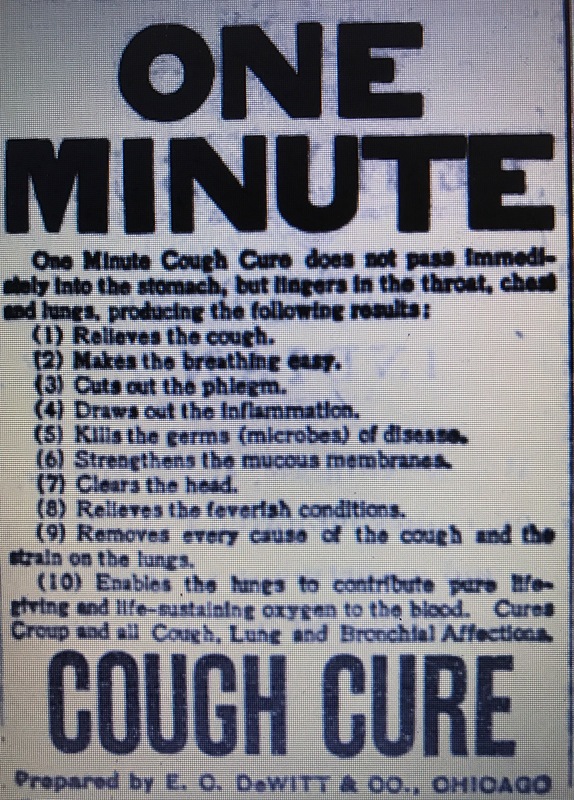 I would have thought that “One Minute Cough Cure” would have come to an end in 1906 when the Pure Food and Drug Act outlawed the mislabeling and amplified claims associated with many patent medicines, effectively eliminating the word “cure” from their labels. However, “One Minute Cough Cure” remained listed in various local drug store advertisements up through the early 1920’s. In fact, an Albany, Missouri drug store named Hardin’s included it on a “Reference List of Standard Remedies carried in Stock at Hardin’s” printed in the January 27, 1921 issue of the Albany Ledger. The bottle I found is a small medicine embossed “One Minute Cough Cure” on the front. The company name and Chicago, USA are embossed on the sides. It’s mouth blown and fits the period from the start of the company in 1890 to the first decade of the 1900’s.